If you're a fan of Designer Papers then you know my dilemma. They're just so pretty its hard to throw away the scraps. 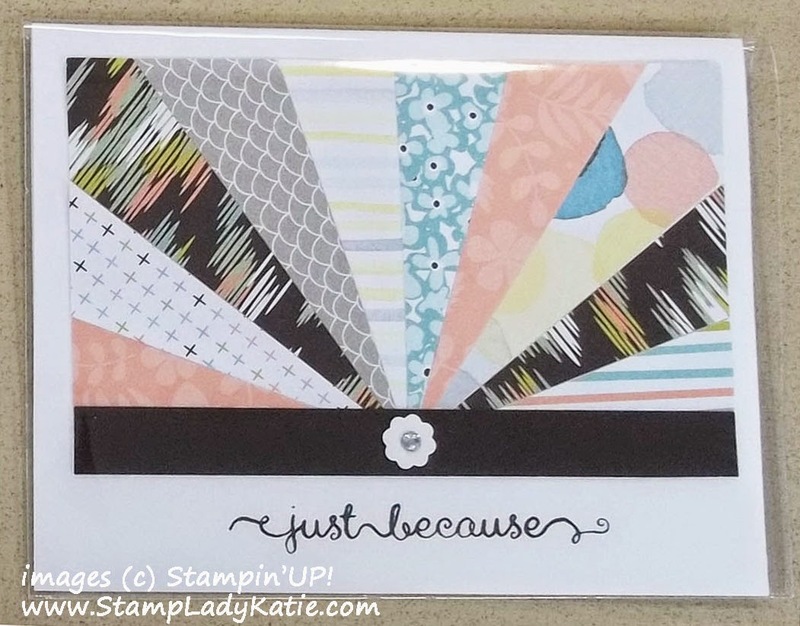 A "Sun Ray" card is one impressive way to use up those pretty DSP scraps. and easy to change up. Just cut strips of paper that are long enough to reach from the center point of the design to the farthest corner. Glue the triangles with the points coming from your chosen center point. It works well with the "center" of the rays in the center of the card or off to one side. I used paper to finish the bottom edge but it would look great with ribbon too. The Sun Ray was our August "Technique of the Month". People attending my events enjoy learning new craft ideas like this and you get written instructions so so you can continue to experiment with the ideas at home. Making it your own: For the class I make a few simple samples and offer a choice of sentiments - it has to be something you'd use right?. And class attendees can always change up the design. Here are a few examples of student projects. I really enjoy teaching these classes - its so fun to watch people get creative. We'd love to have you join us. Are you local to the Madison/Dane County area? Check out my class schedule here. I do monthly classes at 4 local Community Centers (Oregon, Fitchburg, Monona and Verona) as well as classes in my home. I also do private classes for you and your friends at a location of your choice. or sign-up here for one of the events already on my calendar.